The Canon EOS Rebel T5i DSLR Camera with 18-55mm Lens Deluxe Kit from B&H combines the Rebel T5i DSLR and a standard zoom lens with a host of essential accessories to begin working with your new camera and shooting for extended periods of time. The kit includes a battery grip, a wireless radio remote control shutter release, a 32GB SDHC Class 10 UHS-I memory card, an extra rechargeable lithium-ion battery pack, a dual battery charger, multi-coated UV and circular polarizer filters, a microfiber cleaning cloth, an LCD screen protector, and a shoulder camera bag for carrying and protecting the camera, lens, and all of the accessories. Additionally, an extended two-year warranty is also provided for further coverage and protection for your equipment. 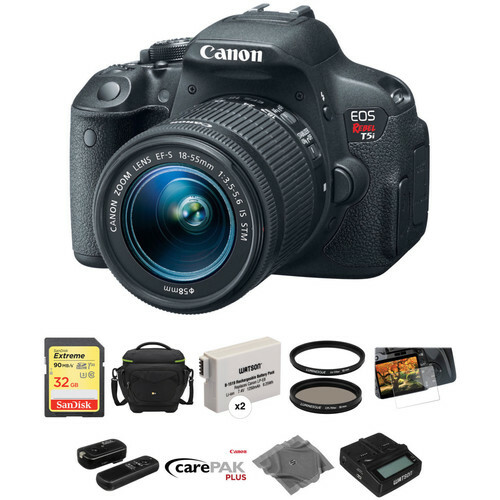 The EOS Rebel T5i DSLR Camera with 18-55mm Lens from Canon is an APS-C format digital SLR camera with an 18MP CMOS sensor and the DIGIC 5 image processor. It is combined with the EF-S 18-55mm f/3.5-5.6 IS STM lens for an effective range of wide-angle to standard focal length. With 14-bit Analog/Digital conversion, an ISO range from 100-12800 (expandable to 25600) and Multi Shot Noise Reduction, the Rebel T5i offers sharp details, accurate colors and low-noise imaging in both bright and low-light shooting situations. Its 9-point all cross-type autofocus system provides fast focusing when shooting with the viewfinder, and Hybrid CMOS AF increases autofocus speeds when shooting in Live View. The Rebel T5i can continuously shoot up to 5 fps. A 3.0" Clear View II Vari-angle Touchscreen LCD with 1,040k-dot resolution provides composition and playback viewing. Its tilt and swivel capability makes it easy to compose your shots at odd angles, and a smudge-resistant coating keeps the monitor clear. Intuitive touchscreen operation includes Touch Autofocus. Scene Intelligent Auto Mode automatically makes the optimal camera adjustments based on scene recognition and improved scene detection is particularly helpful when shooting night scenes. Advanced imaging features such as Handheld Night Scene and HDR Backlight Control make capturing difficult shots easy, and seven Creative Filters add expressive touches to your images and can even be viewed in real time during Live View shooting. The EOS Rebel T5i is compatible with the full line of Canon EF and EF-S lenses. It is paired here with the EF-S 18-55mm f/3.5-5.6 IS STM lens, which offers wide-angle to standard focal length shooting specifically designed for APS-C cameras. It is equivalent to a 28.8-88mm focal length in the 35mm format, and its minimum focus distance is 9.8". This lens features Canon's Optical Image Stabilization system, providing 4-stops of compensation for blur caused by slow shutter speeds when shooting hand-held in low light or at longer focal lengths. An internal focusing system provides fast autofocus, and with a Stepping Motor (STM) and six-group zoom system it supports the Rebel T5i's Movie Servo AF feature for smooth and quiet continuous autofocus during video recording. Manual focus override is possible. A high precision aspherical element reduces chromatic aberration throughout the zoom range for sharp imaging, and Canon lens coatings provide accurate color balance and minimal ghosting and flare. With 14-bit analog-to-digital conversion, the EOS Rebel T5i captures and records images with subtle tonal gradations and details resulting in more realistic and color-accurate images. By recording up to 16,384 colors per channel, the EOS Rebel T5i ensures that the fine details are recorded with accuracy. The Hybrid CMOS AF System is utilized when shooting photos and video in Live View. Combining two different kinds of AF-phase and contrast detection-continuous focus tracking becomes faster and more accurate than ever before in Live View. The EF-S 18-55mm f/3.5-5.6 IS STM lens offers wide-angle to standard length shooting capability specifically designed for APS-C cameras. It is equivalent to a 28.8-88mm focal length in the 35mm format and its minimum focus distance is 9.8". This lens features Canon's Optical Image Stabilization system, providing four stops of compensation against the blur caused by slow shutter speeds when shooting hand-held in low light or at longer focal lengths. An internal focusing system provides fast autofocus and with a Stepping Motor (STM) and six-group zoom system it supports the Rebel T5i's Movie Servo AF feature for smooth and quiet continuous autofocus during video recording. Manual focus override is possible. A high precision aspherical lens reduces chromatic aberration throughout the zoom range for sharp imaging and Canon lens coatings provide accurate color balance and minimal ghosting and flare. The Canon Rebel T5i is compatible with all EF and EF-S lenses. The Rebel T5i offers continuous shooting rates up to 5 fps at full resolution. The EOS Rebel T5i features lens correction tools that compensate for lens characteristics that can affect overall image quality. The EOS Rebel T5i's Peripheral Illumination Correction feature corrects light falloff in the corner of the image according to the characteristics of the lens being used. It even has correction data for a number of popular lenses stored in its memory. With the EOS Rebel T5i's chromatic aberration correction tool, distracting color fringing can be corrected at the time of shooting. With the optional GP-E2 GPS Receiver attached to the hot shoe or the digital terminal, the EOS Rebel T5i can record location, including latitude, longitude and altitude, and has the ability to track the trajectory of movement with its logging function. An electronic compass records the camera's orientation during each shot, and world time information is recorded through GPS synching. Photographers can share their images in book form with the EOS Rebel T5i's convenient Photobook Set-up feature. Users can easily choose specific images, images in a folder and even all images, then specify their sequence and layout. The results can be printed in book form with ease. The Watson LP-E8 Lithium-Ion Battery Pack works with the same cameras as the Canon LP-E8. This replacement battery pack features a capacity of 1250mAh, 7.4V of output power, and 9.25 watt-hours. Small and lightweight, lithium-ion batteries can be charged or discharged at any time without developing memory effect. Combining two of the most useful filters available, Luminesque's 58mm Circular Polarizer and UV Slim PRO Filter Kit is well-suited to all forms of photography. Both filters are constructed from Schott optical glass and feature a 12-layer multi-coating for maintained clarity and image quality. Each filter is also set in an anodized aluminum filter ring, with the UV filter featuring a slim 3.4mm-thick profile to lessen the likelihood of vignetting with wide-angle lenses. This LCD Screen Protector Ultra from Vello is a sheet of ultra-thin (0.02") optical glass used to safeguard the LCD monitor of the Canon EOS 77D, Rebel T4i, T5i, T6i, T6s, and T7i. It easily adheres to the screen via static, without trapping air bubbles, and if removed, won't leave a sticky residue behind. Multiple layers of protective material shield your display from dirt, scratches, sweat, smears, and light impact. The shatter-proof glass blocks UV rays while allowing visible light in. Additionally, the protector enables touchscreen operation. It can be easily cleaned using the supplied microfiber cloth and wet wipe. The FreeWave system also has access to 16 channels for triggering multiple receivers and has an internal antenna that will be protected from any accidental damage. Multiple features are available for shooting, such as a four-second delay as well as multi-exposure and long exposure modes. The device also has a dual function release, enabling focus on half press and triggering the shutter release on a full press. Additionally, it has LED indicators to confirm pre-focus and exposure while in wireless mode and the receiver and transmitter each run on two AAA batteries. Keep your valuable equipment protected with this 2-year CarePAK PLUS Accidental Damage Protection from Canon. This plan is for Canon EOS DSLR cameras, excluding the Cinema line, purchased inside the USA with a purchase price between $500 and $749.99. It covers incidents of accidental damage, including dropping, power surges, and spilling liquids, as well as wear and tear that occurs during regular use such as dust or dirt on the sensor. You can acquire this service plan up to 90 days after buying your product, and it will be in effect for 2 years starting from the original purchase date of your camera. Safely clean your glass lenses, television screens, computer monitors, binoculars, and more with this gray Microfiber Lens Cleaning Cloth from Sensei. This handy item is also useful for wiping dust or smudges off CDs, DVDs, or Blu-ray discs. The soft microfiber fabric will not scratch glass or other sensitive surfaces, and allows for streak-free cleaning. One side of the cloth features a covering of textured rubber dots to give you a more secure grip, preventing the cloth from slipping out of your hand. Additionally, the fabric is approximately 18% gray, so it can assist you in setting your camera's white balance. At only 7 x 7.9" in size, the cloth is small and easily packed in a pocket, pouch, or bag for convenient carrying. It's also machine washable in cold water on a gentle cycle for reuse again and again. The Duo LCD Battery Charger from Watson charges 1 or 2 batteries of various types via dedicated interchangeable plates, which are required and available separately. The Duo can even simultaneously charge 2 different batteries with different voltages. It runs on 100-240VAC power, allowing for use all over the world. Charging time is between 2 and 6 hours, and the charger also features a USB 2.0 port for charging another device simultaneously. The LCD screen provides a digital read-out of each battery's charge percentage--even when the charger is unplugged--via the test button. The Duo includes a power cord with a 2-prong US plug, as well as a 12VDC car charger that plugs into a cigarette lighter. The Watson Battery Adapter Plate for LP-E8 enables you to charge any Canon LP-E8 type battery using your Watson Compact AC/DC or Duo LCD Charger. Watson Compact AC/DC and Duo LCD Chargers feature an interchangeable battery plate system. This economical option allows you to charge many different batteries, all with one charger. Use this plate to expand your charger's compatibility or to replace a lost plate. This is a 2 oz Solution Spray Bottle from Field Optics Research. It contains a specially designed cleaning formula that is particularly effective on high-end optics with anti-reflective coatings. The non-alcohol based formula can be used on all lenses to help keep them free from fingerprints, dust, dirt and smudges. The bottle produces a fine mist that is easy to remove. Box Dimensions (LxWxH) 10.6 x 6.45 x 2.95"
Box Dimensions (LxWxH) 5.0 x 1.0 x 0.1"
EOS Rebel T5i DSLR Camera with 18-55mm Lens Deluxe Kit is rated 5.0 out of 5 by 2. Rated 5 out of 5 by Blanche from I like this camera This is my first EOS camera; a step up from my GShot 10, and I am so glad I have done this. I like the touch screen and the Creative Auto. It will take some getting used to as there is so much this camera can do, but I am willing to learn. Rated 5 out of 5 by Emi from Love this product This camera is easy to use and great for beginners, yet still produces crisp, and clear pictures. The video this camera takes is also great and can run for a long time. I purchased this t5i on March 2017. I realize there are lots of hissing noise when recording with Rode VideoMic that came with it, so I tried to lower the volume of sound recording through manual mode. Surprisingly, there were only two options: On and Off. Why there is no manual setting option for sound recording like the Instructor Manual said and all the other t5i models produced on 2013? Try putting the camera into a manual mode. That will give you more audio options.